The Bible teaches that ALL who are followers of Yeshua (Jesus) are to plan and prepare for a “journey.” The trip is not only undertaken when we move to Heaven following death …but it is also a very unique one that will take place at the End Times as we know it. We are told that believers in the last generation are a privileged generation. This generation will NOT experience physical death, but will be caught up in what is called the “Rapture” or the “snatching away” to meet our Lord in the air and be reunited with loved ones who have died in Christ and have gone before us. It will be the journey of a life-time and a trip that is simply “out of this world.” Are we ready for this…? 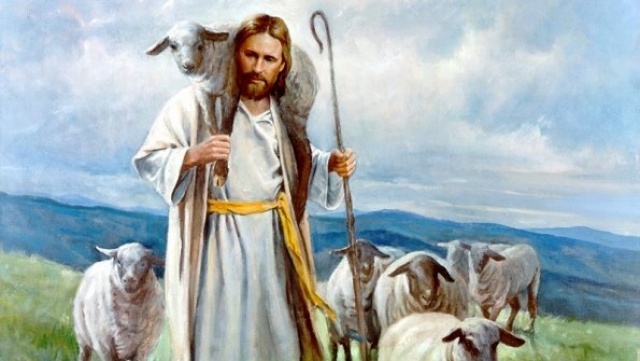 What is the primary purpose of this amazing trip called the “catching away” or “the Rapture?” One area of prophecy that is the most significant for Christians is the expectation of Yeshua (Jesus) return for His Church. The “Rapture” is the moment when the Lord comes in the air to “catch away” all who are spiritually ready. The Rapture is the doorway between two opposite worlds… On earth; we have war, lawlessness, rebellion, sin, suffering, and strife. In heaven; there is nothing but holiness, happiness, and cries of “hallelujah!” “For the Lord Himself will descend from heaven with a shout, with the voice of an archangel, and with the trumpet of God. And the dead in Christ will rise first. Then we who are alive and remain shall be caught up together with them in the clouds to meet the Lord in the air. And thus, we shall always be with the Lord,” 1 Thessalonians 4:16-17. (also read: John 14:1-3 and 1 Thessalonians 5:10-11). What Scriptures indicate that we will leave suddenly? “Behold, I tell you a mystery: We shall not all sleep, but we shall all be changed— in a moment, in the twinkling of an eye, at the last trumpet. For the trumpet will sound, and the dead will be raised incorruptible, and we shall be changed,” 1 Corinthians 15:51-52. (also read: Matthew 24:36-44). Here we need to ask the question …are we as believers ready to leave at a moment’s notice? “Therefore, you also be ready, for the Son of Man is coming at an hour you do not expect” Matthew 24:44. Because, the “Rapture” is likely to be the next major event for believers on God’s calendar, it’s all-important to be aware of the Rapture’s nearness. For those who sadly find themselves left behind …they would suffer a double tragedy; missing out on the splendour of heaven and having to face the various judgments God will be pouring out on the earth. Once a person is left behind, though their body might be in a dreadful state of affairs their soul still has a chance at redemption. We have a difficult time understanding that the Tribulation is a time when people will be able to blissfully wait for Yeshua (Jesus) to come and rescue them again? The Great Tribulation is going to be a time of immense persecution! Few people realize we are living with a window of opportunity that will soon close. Most of the people who will find Salvation after the Rapture will not physically live to see the Lord’s glorious return. The “Rapture” is clearly something any person with a logical mind would not want to miss. Unfortunately, most people are unprepared to meet the Lord. One of the biggest reasons for the lack of readiness has to be the fact we are drowning in a sea of warning signs. “So likewise, you, when you shall see all these things, know that it is near, even at the doors. Verily I say unto you, This generation shall not pass, till all these things be fulfilled,” Matthew 24:33-34. In the meantime, we are to comfort one another! - 1 Thessalonians 4:18; 1 Thessalonians 5:11. 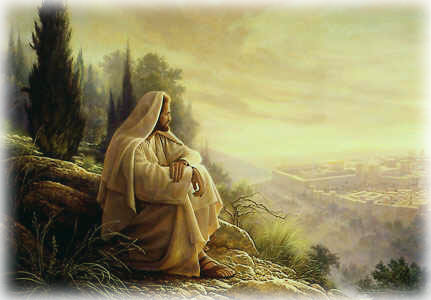 IT must have been a remarkable thing to sit there on the Mount of Olives overlooking the 2nd Temple in Jerusalem when Yeshua uttered Matthew 24:45-47 one of His most fascinating prophecies on End-Times… Peter, Andrew, James, and John paid attention as our Lord cast His prophetic gaze far, far into the future for 2,000 years later. Yeshua told them a great deal about the Last Days of this wicked world system, the time when He would be ruling in God’s Kingdom. 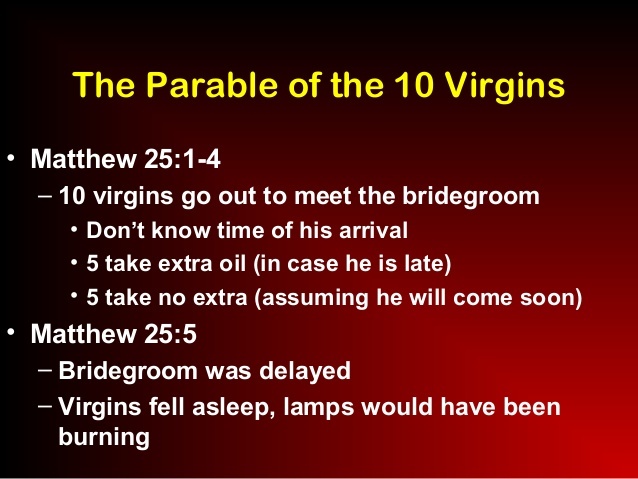 Next, in that same prophecy, Yeshua (Jesus) related “the Parable of the Ten virgins” - here He was talking about His return; “At that time the kingdom of heaven will be like ten virgins who took their lamps and went out to meet the bridegroom. Five of them were foolish and five were wise. The foolish ones took their lamps but did not take any oil with them. The wise ones, however, took oil in jars along with their lamps. The bridegroom was a long time in coming, and they all became drowsy and fell asleep. At midnight the cry rang out: ‘Here’s the bridegroom! Come out to meet him!’ Then all the virgins woke up and trimmed their lamps. The foolish ones said to the wise, ‘Give us some of your oil; our lamps are going out! ‘No,’ they replied, ‘there may not be enough for both us and you. Instead, go to those who sell oil and buy some for yourselves.’ But while they were on their way to buy the oil, the bridegroom arrived. The virgins who were ready went in with him to the wedding banquet. And the door was shut. Later the others also came. ‘Lord, Lord,’ they said, ‘open the door for us!’ But he replied, ‘Truly I tell you, I don’t know you.’ “Therefore, keep watch, because you do not know the day or the hour!’” - Matthew 25:1-13. The “Rapture” is something we believe most people are interested in, or at least curious about …but, unfortunately are very confused about. This of course is also due to all the different “Rapture” theories out there; Pre-Tribulation, Mid-Tribulation etc, and also because most churches - even evangelical churches …choose NOT to talk about it! In fact, the entire subject of prophecy is sadly avoided like the plague. It’s a great tragedy of Christians who reject “Bible Prophecy” and who refuse to read it or hear it preached as they will be left in a state of frustration, without hope, without real joy, and without a complete understanding of the will of God especially in these Last Days. Why? Because prophecy is that part of Scripture that tells us how it all will end - it is that part that fills in the gaps …and brings us understanding and blessing. A person who NEVER reads prophecy, though he may read the rest of Scripture, will get frustrated and won’t have a sense of the whole will of God. But, those of us who read and study Bible Prophecy are encouraged and have the promise for a bright future here on earth and what lies ahead in the near future and the eternal life to come! Some say that it doesn’t matter regardless what we believe about the rapture …and that it will NOT change anything because God will do what He has planned to do anyway - so why does it even matter? Our answer is that your study time on prophecy will NOT affect God’s plans …but it will affect you and how you fit into His plans. The Parable of the “5 Wise - 5 Foolish Virgins” teaches us that a time is coming and a day with two different groups… those who prepared themselves and faithfully watched for the Lord’s Coming …and those who were NOT prepared! Those who were not prepared will hear the Lord say the most terrifying words; “Assuredly, I say to you, I do not know you!” – Matthew 7:21-23. If the Lord were to come today… Would He find us watching…? Would He find us prepared…? Would He even know us…? Even though we have read Matthew 25:1-13 many times did not realize that this passage actually describes the experience of un-believing believers. Yeshua (Jesus) also had a few choice words for ALL believers! You see ALL ten virgins took their lamps and went out to meet the bridegroom. Of the ten, five of them were foolish and five were wise – exactly half! The foolish ones took their lamps but did not take any oil with them. The wise, however, took oil in jars along with their lamps. Here we learn that the bridegroom was a long time in coming …and, they ALL became drowsy and fell asleep! ALL Christians became sleepy and fell asleep! The whole true Church of the End-Time “spiritually” has fallen asleep! Christians, generally spoken, are not aware of the “spiritual” dangers, which surround them and mortally affect them! This is a spiritual condition, in which we as a whole “Body of Christ” still are today! We are living in the night season of the Church! “For the darkness shall cover the earth and deep darkness the peoples; but the Lord shall rise upon you, and His glory shall be seen upon you,” Isaiah 60:2. Deep darkness is surrounding the people and never in the past century have we seen such lawlessness, destruction of the family as a whole, rise of homosexuality, babies killed in the womb and their body parts sold – sin on the rise. But, God is not caught unawares – He warned us beforehand! God is not unaware of the “darkness” and even in darkness His people will find refuge and covering. “Then the Lord will create upon every dwelling place of Mount Zion, and upon her assemblies, a cloud and smoke by day and the shining of a flaming fire by night. For over all the glory shall be a covering,” Isaiah 4:5. Even in the “night season” and “deep darkness” the Glory of the Lord …and the fire of God shall be seen on His people. Israel during their wilderness journey witnessed this …but think about how much more shall this manifestation be enhanced during the days of the outpouring of the Spirit in this Church Age? The question is, are you ready – are we ready? Are we being continually filled with the Spirit and burning with the fire of God? “Let your waist be girded and your lights burning, Luke 12:35. In Bible times, in order to have freedom of activity, men tucked the skirts of their long robes into their belts around their waist. This signified a readiness of action! But. in the “night” that instruction would not benefit them without also having their lamps burning. When we have NO oil, our lamps cannot be kept burning. “And they said to one another, 'Did not our heart burn within us while He talked with us on the way and while He opened the Scriptures to us,’” Luke 24:32. Not having the fullness of the Holy Spirit in our lives is sort of like driving a car at night without the lights on! Our lamps are the Word of the Lord that burns in our spirits through the infilling of the Holy Spirit. “The spirit of man is the candle of the Lord, searching all the inward parts of the heart,” Proverbs 20:27. 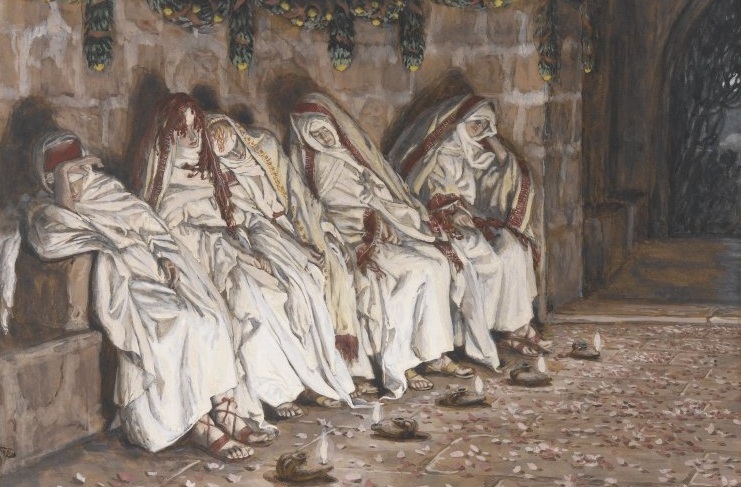 The point of the Parable of the 5 Wise and 5 Foolish Virgins is that even though the 10 virgins are all saved they were NOT all ready for the coming of the bridegroom... “While the bridegroom delayed, they all rested and slept,” Matthew 25:5. At the “Midnight” hour… The Lord, before His Second Coming as “Bridegroom,” comes to the rescue, to help His Sleepy Church, and brings about a general awakening (Matthew 25:6-7). And, at midnight there was a cry made; “Behold, the “Bridegroom” comes! Go out to meet Him!” Then ALL 10 Virgins arose from their sleep, and trimmed their lamps - this call of the Holy Spirit happens at midnight! This also means, that this call happens in a period of the darkest social, political, spiritual and military circumstances, in dark “times of rumours of war” and war-time! This gracefully coming “Rapture” rescue of Yeshua is meant to prepare God’s children for the coming - Divine Wedding Festival – to sit at the table of the Marriage Supper of the Lamb (Revelation 9:9). In other words… they perfectly partake of the death and resurrection of the Lamb. Here it is referred to as a Wedding Festival or unity with the Lamb of God. The Bride has to unite herself with the Bridegroom, who already has Resurrection Life! Therefore, she has to be made holy, without blemish, without spot or wrinkle! At midnight the cry rang out - the bridegroom had come when and at a time they least expected! Then ALL the virgins woke up and trimmed their lamps. The foolish ones panicked and went on their way to buy oil - but it was too late because the bridegroom already come! Why…? Because, they simply weren’t ready or refused to believe! The five virgins who were ready went in with Him to the Wedding Banquet. And the door was shut! Here we can see comparison to the Days of Noah and the Lord’s return (Genesis 6:16; Matthew 24:37-39). Remember it was God who shut the Ark – it was too late! Later, the five foolish virgins cried – “Open the door for us!” But, the saddest words anyone could ever hear is the Lord saying – “I DID NOT KNOW YOU!” Yeshua (Jesus) is the door (John 10:9). We as believers are called to keep watch, because we do not know the day or the hour!" (Matthew 25:1-1). 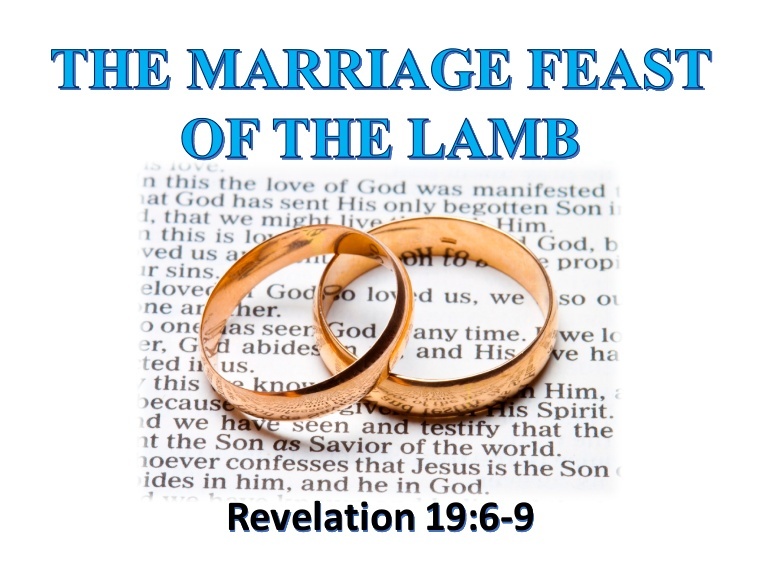 In his vision in Revelation 19:7-10, John saw and heard the heavenly multitudes praising God because the Wedding Feast of the Lamb - literally, the “Marriage Supper” …was about to begin! The concept of the marriage supper is better understood in light of the Jewish wedding customs in the time of Christ! These wedding customs had three major parts. Firstly; a marriage contract was signed by the parents of the bride and the “bridegroom,” and the parents of the bridegroom or the bridegroom himself would pay a dowry to the bride or her parents. This began what was called “the betrothal period” what we would today call the engagement. This period was the one Joseph and Mary were in when she was found to be with child (Matthew 1:18; Luke 2:5). The second step; in the process usually occurred a year later, when the bridegroom, accompanied by his male friends, went to the house of the bride at midnight, creating a torchlight parade through the streets. The bride would know in advance this was going to take place, and so she would be ready with her maidens, and they would all join the parade and end up at the bridegroom’s home. This custom is the basis of the Parable of the “Ten Virgins” in Matthew 25:1-13. The third phase was the marriage supper itself, which might go on for days, as illustrated by Yeshua’s (Jesus) first miracle at the Wedding at Cana in John 2:1-2. Weddings in Biblical times usually lasted for 7 days (the number 7 is very significant; 7 Churches in Revelation; God created world in 6 days and on the 7th day He rested, The Great Tribulation will be 7 years etc). During which time food and wine supplied by the bride and bridegroom’s families flowed freely. To run out of either would imply a thoughtless host. Running out of wine would bring dishonour upon their name. It is interesting that the quality of wine Yeshua (Jesus) supplied was superior to any wine served thus far, the Lord’s creation of the wine from water may be significant, prophetically. Jeremiah had foretold that in the Messianic Age; “they will rejoice in the bounty of the Lord – the grain – the new wine!” – Jeremiah 31:12. The fact that the miracle was performed at the wedding was also significant. By the Lord’s attendance He placed the stamp of His approval on the marriage covenant! And, with this miracle Yeshua shows from where the blessings in a marriage comes from. The love and joy of in a wedding ceremony are also characteristic to the Lord’s ministry who came into this world because of God’s love (John 3:16) and Yeshua (Jesus) brought joy to all who believed in Him! (Luke 2:10). The Wedding narrative has symbolism for the calling out of the “physical” Nation of Israel, the sacrifice of Messiah Yeshua and the drawing out of the people who would make up the Body of the Church! In John 2:1-2 the wine ran out on the 3rd day and there are many instances of the events occurring on the 3rd Day. The most notable is the “Resurrection” of the Lord on the 3rd Day. We are therefore able to draw out a theme of deliverance, salvation or life, associated with the 3rd Day! In Exodus 19:11,15, the congregation was asked to be ready by the 3rd Day, for it was on this day that God, through His angel (Christ) came in the sight of all the people to enter into a Covenant. 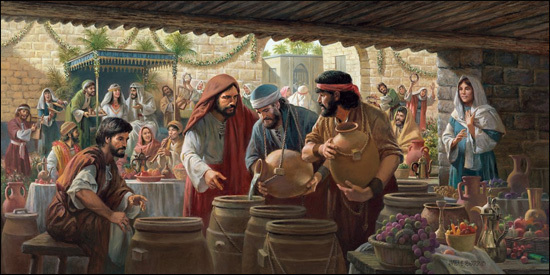 Likewise, Christ, accompanied by His Disciples came to the Wedding at Cana, where a covenant between a bride (equivalent to the Church) and the Groom (comparable to Yeshua – Jesus) was to take place. 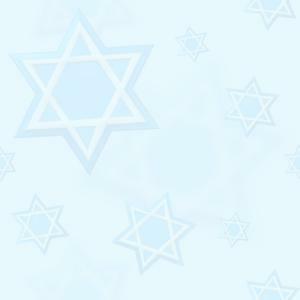 Yeshua was to reveal Himself through His first miracle to the “servants” (pictures those that are called; believers). So, here we see that John’s vision in Revelation pictures is the Wedding Feast of the Lamb (Yeshua - Jesus Christ) and His bride (the Church) in its 3rd phase. Let’s stop and ponder here: 1. All the virgins believed the bridegroom was coming and they went out to meet Him. 2. Fatigue overtook them and ALL of them went to sleep! 3. When awakened, it became clear as to who was wise and who was foolish. 4. The wise could NOT help the foolish. 5. The foolish were NOT permitted into the banquet. 6. ALL ten of them were virgins. Yeshua HaMasiach (Jesus Christ) came the first time to make the Covenant and when He comes the second time will come to take us to our heavenly home… The implication is that the first two phases have already taken place. The first phase was completed on earth when each individual believer placed his or her faith in Christ as Saviour. The dowry paid to the bridegroom’s parent (God the Father) would be the blood of Christ shed on the Bride’s behalf. The Church on earth today, then, is “betrothed” to Christ, and, like the “wise virgins” in the parable, all believers should be watching and waiting for the appearance of the Bridegroom (the Rapture). The second phase symbolizes the Rapture of the Church, when Christ comes to claim His bride and take her to the Father’s house. The Marriage Supper then follows as the third and final step. It is our view that the Marriage Supper of the Lamb takes place in Heaven between the Rapture and the Second Coming (during the tribulation on earth). Attending the Wedding Feast will be not only the Church as the Bride of Christ …but others as well! The “others” include the Old Testament saints - they will not have been resurrected yet, but their souls/spirits will be in Heaven with us. As the angel told John to write, “Blessed are those who are invited to the marriage supper of the Lamb,” Revelation 19:9. The Marriage Supper of the Lamb is a glorious celebration of all who are in Christ! To be a part of the Wedding Feast – one must be invited! It is God who does the choosing. Christ does not give the invitation so to speak. God draws the person, and gives them to Christ (John 6:39). The accepting of the invitation requires something on our part. Abraham took up his invitation to enter into a Covenant with God, by adhering and obeying ALL of God’s Statues and Laws. He considered God’s Law a treasure to be desired! We must also do likewise, if we are to accept the invitation! We are to continue to obey God’s Word and Commandments, if we are to retain His Holy Spirit and enter the Wedding Feast! 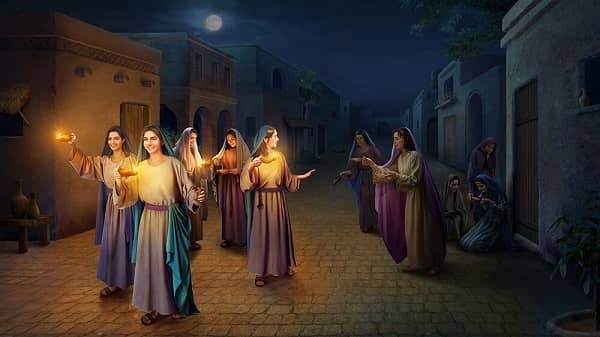 The Parable of the 5 Wise and the 5 Foolish Virgins shows that those who still had “oil” in their lamps burning, were able to enter into the Wedding Feast. Outwardly they ALL looked the same but it was those who treasured the Word of God and had the Holy Spirit, who were able to enter when the Bridegroom returned! The 10 Virgins (5 foolish and 5 wise) represent the Kingdom of Heaven, which is the corporate Body of Christ or Church as a whole. The parable does not indicate that every Christian is asleep! However wearily the Church has been watching and waiting for 2,000 years for our Lord to return …but the fulfilment of His promise has not YET come to pass! Prophetic fatigue has overtaken God’s people. Important to remember that it could NOT happen until Israel had returned to the land and this happened in 1948! During the years we have taught on the importance of “Prophecy” and also the Prophetic – “Feasts of the Lord.” Many have learned to study them but some have NOT realised their significance as Christians because they believe it to be Jewish and not for the Church. This is so wrong and many believers are simply not getting the full blessings that God has for them if it is NOT taught and especially in the Church. The Feasts of the Lord and Prophecy both give us glorious HOPE of our “soon coming King and Saviour” - while we wait we are blessed by being obedient! Today, there is more contempt than genuine interest in Israel and for the prophecies of Daniel and Revelation among Christians! "Yeshua (Jesus) is coming soon" is a phrase that has been said so many times that no one actually anticipates and many don’t believe it… The underlying problem with the ten virgins was fatigue and familiarization. We as believers have heard thousands of times that “our Lord is coming soon” and after 2,000 years, “soon” has lost its meaning …and many have thrown in the prophetic towel. Many do not give enough thought to the prophecies even though one third of the Bible is prophecy. They reason that tomorrow will be much like today. One day, this assumption will prove false. There are two tomorrows. There is the tomorrow - that segment of time - that occurs before the censer is thrown down. The second tomorrow occurs when the censer is thrown down causing events unlike anything the world has ever seen! Keeping these tomorrows balanced is NOT easy and so who can stay awake during the night? The world is only a fleeting moment of time - our house on earth that is destined to fade away with all it’s sin and concerns. The next time we see Him, whether at the Rapture on that glorious day or on the day we as true believers finish our race and life on this earth – it will be to take us home – to the place He has prepared for us … of no more tears, pain and sorrow. The bride’s home (earth) is fading away and soon we won’t be able to see it any longer - so will it be with creation as we look forward to the “Bridegroom’s” house which is the place of deep longing in every believer’s heart! The New Testament Greek words for “anoint” are “chrio,” which means “to smear or rub with oil” and, by implication, “to consecrate for office or religious service” and “aleipho,” which means “to anoint.” In Bible times, people were anointed with oil to signify God’s blessing or call on that person’s life (Exodus 29:7; 40:9; 2 Kings 9:6; Ecclesiastes 9:8; James 5:14). A person was anointed for a special purpose - to be a king (1 Samuel 16:1), or a prophet, or a priest (Exodus 28:17; Leviticus 8:12, 30; Numbers 4:17). Only God who can anoint a person for a specific purpose. Another meaning for the word “anointed” is "chosen one!" The Bible says that Yeshua (Jesus) Christ was anointed by God with the Holy Spirit to spread the Good News and free those who have been held captive by sin (Luke 4:18-19; Acts 10:38). After Christ left the earth, He gave us the gift of the Holy Spirit (John 14:16). Now all Christians are anointed, chosen for a specific purpose in furthering God's Kingdom (1 John 2:20). "Now He who establishes us with you in Christ and has anointed us is God, who also has sealed us and given us the Spirit in our hearts as a guarantee," 2 Corinthians 1:21-22. “Oil” in the Scriptures symbolizes the “Baptism of the Holy Spirit” …and the Bride of Christ (the Church) needs "OIL”- desperately today in a wicked world in order for her to walk in the Light, as “He is in the Light!” In the Bible olive oil is mentioned several times as the oil used for lighting lamps (Leviticus 24:2). 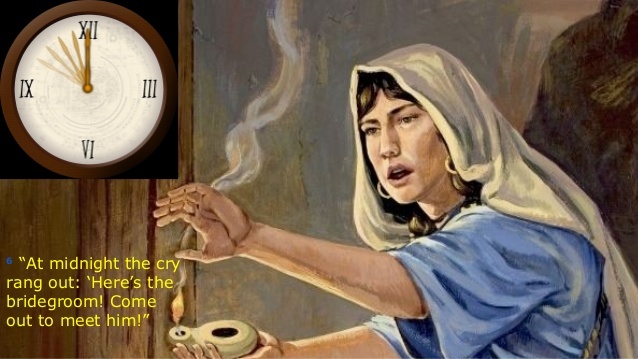 And so, we see that the “oil” is used as a symbol for the Holy Spirit in the Bible as in the “Parable of the 5 Wise and 5 Foolish Virgins (Matthew 25:1-13) to keep their lamps filled. Those virgins with “oil” in their lamps were able to make it to the Rapture. While those virgins without the “oil” were left behind in the Tribulation Period, wailing, weeping and gnashing their teeth. Christ, the Bridegroom, has already appeared today in Spirit form through the ministry of the End-Time prophet Elijah as prophesied in Malachi 4:5-6. His ministry is to set and restore the hearts of the children back to the fathers, before this earth is finally destroyed by fire. One day, Yeshua (Jesus) will close the door of grace upon those that are without the "OIL" and will Rapture only those that have been filled with it. While the foolish virgins were away trying to find the “Oil” - "Baptism of the Holy Ghost" in their lives, Christ and the true Bride goes away for the “honeymoon” in Heaven. She will be taken off the scene for three and a half years while this earth undergoes purging through the Great Tribulation Period. John the beloved saw the Church in her position as Christ’s wife, for she has been impregnated by the Word of God. In Revelation 19:7, the Word of God exhorts us saying; “Let us be glad and rejoice, and give honour to Him: for the marriage of the Lamb is come, and his wife hath made herself ready.” At the “Rapture” there will involve an instantaneous transformation of our bodies to fit us for eternity… “We know that when He (Christ) appears, we shall be like Him, for we shall see Him as He is,” 1 John 3:2. The “Rapture” is to be distinguished from Christ’s Second Coming. At the Rapture, the Lord comes “in the clouds” to meet us “in the air” (I Thessalonians 4:17). At the Second Coming, the Lord descends all the way to the earth to stand on the Mount of Olives, resulting in a great earthquake followed by a defeat of God’s enemies (Zechariah 14:3-4). The doctrine of the Rapture was not taught in the Old Testament, which is why Paul calls it a “mystery” now revealed; “Listen, I tell you a mystery: We will not all sleep, but we will all be changed - in a flash, in the twinkling of an eye, at the last trumpet. For the trumpet will sound, the dead will be raised imperishable, and we will be changed,” 1 Corinthians 15:51-52. The soon rebuilding of the prophesied 3rd Jewish Temple on the Temple Mount (Mount Moriah) in Jerusalem - as the Bible tells will happen! The increased hostility toward Israel. With the rise of “radical” Islam and the political advances toward a One-World - One-Religion Antichrist Government are all signs of the End-Times. But, the most prominent sign of the End-Times is the nation of Israel! In 1948 everything began to change when Israel was recognized as a Sovereign State - essentially for the first time since AD 70 …and the prophetic clock began to tick fast! This year Yom Ha’atzmaut – Israel’s Independence Day will begin at sundown 18th April through to sundown 19th April, 2018 …and Israel will celebrate 70 years as a re-born State and Nation! God promised Abraham that his generations (through Abraham, Isaac and Jacob) would have the Land of Canaan as “an everlasting possession” (Genesis 17:8). Ezekiel prophesied a physical and spiritual restoration of Israel (Ezekiel 37). Having Israel as a nation back in its own land is very important in light of End-Times prophecy (Daniel 10:14, 11:41; Revelation 11:8). The apostle Paul warned us 2,000 years ago that the Last Days would bring a marked increase in “false teaching!” Today, we see how some have even changed the Bible if it didn't fit their liberal agenda and the wording of many of the verses changed …or simply deleted! “The Spirit clearly says that in later times some will abandon the faith and follow deceiving spirits and things taught by demons” (1 Timothy 4:1). The Last Days are described as “perilous times” …because of the increasingly evil character of people who actively “oppose the truth” (2 Timothy 3:1-9; 2 Thessalonians 2:3). With these “signs” in mind, we can be wise and discerning in regard to the expectation of the End-Times, but, we should never interpret any of these singular events and set dates for our Lord’s soon return because “nobody knows”- not even the angels! Let’s consider the Bible to be like a “great novel” …and in this “great novel” every part of it is important to understand the story and what the story is that God is telling us and preparing us for. The prophetic parts are especially important because they give us clues to how the story will end. And, the last book of the bible tells us plainly how it will end! It is the climax of the novel and a story of God’s plan for us and for the future. Without those vital parts we have an incomplete Book. We just have a very good book - but a book without an ending …and really, a book without a purpose. If we neglect to read the prophecy parts which consist of a third of the bible is like reading a novel and then stopping just when you get to the last chapter. Who does that? Most of us do the opposite because we are so eager to get to the end to find out how the story ends! When we study the Word as we all should (2 Timothy 2:15), it will be to us a light (Psalm 119:105) and will show us the truth. The words of “Prophecies” studied will help us to understand God and His will …and thus God will help us to be prepared for it …and it will give us hope for the future. Ultimately, our diligent study of “Prophecy” and how we believe and obey those Scriptures, will affect our part in the Kingdom of God for ETERNITY! How valuable is our time on earth? Our days on earth are precious and come around only once in an eternity – every moment only once and never again. Every day only once and we should treat it as though it is rare and precious because that it what it is – priceless! We cannot take back last year so since this New Year 2018 (5778) will come around once as a moment in history! Let’s treat God’s gift of time as precious – rare - valuable and priceless, each day looking to Yeshua the author and finisher of faith! Time is measured in Eternity! Yeshua (Jesus) has however given us enough information in Matthew 24:5-8 that we can be prepared! And, that is what we are called to be – prepared! In this passage, though, we are given a warning that we are not to be deceived and that these events are the beginning of “birth pains” …but the end is still to come - even as our hearts cry out… “Come, Lord Jesus” – Revelation 22:21.